Samin Ahmadzadeh (b. 1989) holds a BA Photography from Azad University (Tehran, Iran) and an MA Photography from Central Saint Martin's School of Art & Design (London, UK). Her work has been exhibited in Iran, Spain, and the United Kingdom. 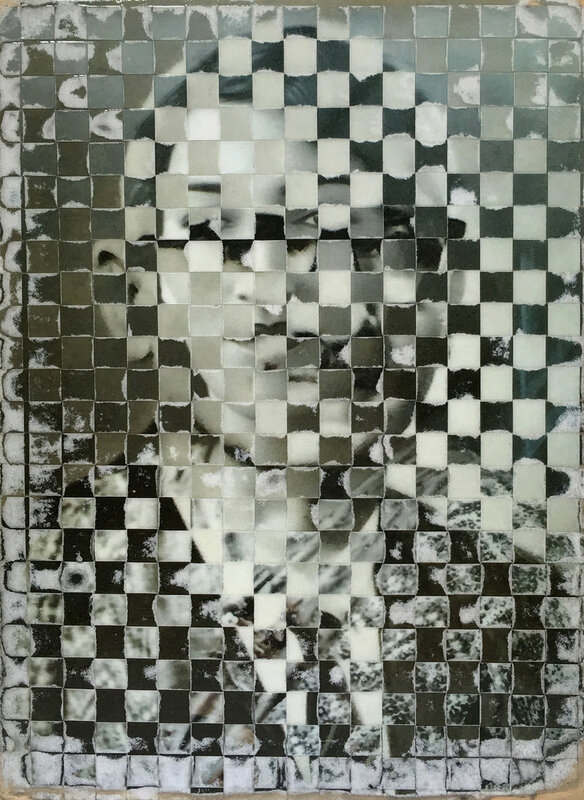 The artist works with archived photographs, re-assembling them into new narratives that draw the viewer's attention to how memory and identity is interwoven. 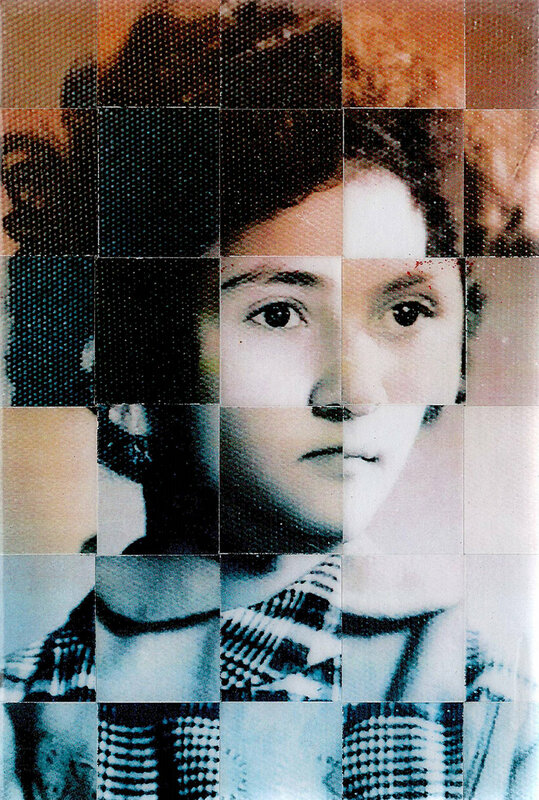 Her source material is made up of archived photographs—including from her own family album—mined for specific projects. Sami is represented by the Klompching Gallery in New York, and lives and works in London. Samin Ahmadzadeh: I have been born and raised in a large Iranian family. Iran is famous for its rich culture and long history as one of the world’s oldest civilizations, so I have always had a great interest in reflecting my country’s social, cultural and historical matters. I come from a large family with great interest in photography and documenting their daily life so I am very lucky to have access to an amazing archive starting from the 1920’s which my family has been collecting over the years. We all treasure the archive and keep expanding it as time goes by. These photographs narrate a private family history and represent glimpses of the past and intimate memories but at the same time, they can also be considered as a public (social) document with wider meanings. AT: Has family, place and history always influence your work? What was the moment that made you say this is how I want to work, this is the material I want to use for my work? SA: At first I was mostly focusing on documentary photography, exploring cultural and sociological matters of Iran through photographing people and the city. But when I moved to London to study MA Photography, I decided to approach these concepts differently and use archival materials from my family’s past. I started by focusing on archival photographs and material specifically about my father’s childhood, but my interest kept growing as I found more images from my family history which was when I decided to expand the archive and continue using them as source material. I felt that through contemporary representations of my archive I can provide the space for further analysis in social, political and cultural fields. SA: I went on a geometry course around Iran in 2015 which had a great influence on my work. I have always been fascinated by the geometrical factors used in the Iranian architecture and Islamic art. As an Iranian, I have been surrounded by a variety of these patterns in my daily life, but going on the course helped me understand the science and the complexity of the details behind it all. This was one of the main reasons for me to start looking deeper into the use of shapes and geometry within my work. I see the circle as a complete shape that can represent unity and harmony. So I believed that it suited the whole idea of the installation and the unity between the two sets of family archives (Eastern and Western) that I was using in that specific installation. It was a very labour intensive piece of work. Nottingham Museum shared my vision of a large installation and commissioned me to make it as part of the ‘Reportrait’ exhibition. The act of making is an important part of my project. Weaving by itself is a very detailed and time-consuming process which I really enjoy. It is through the process of weaving that I relate more with the images that I am using and envision the final piece. 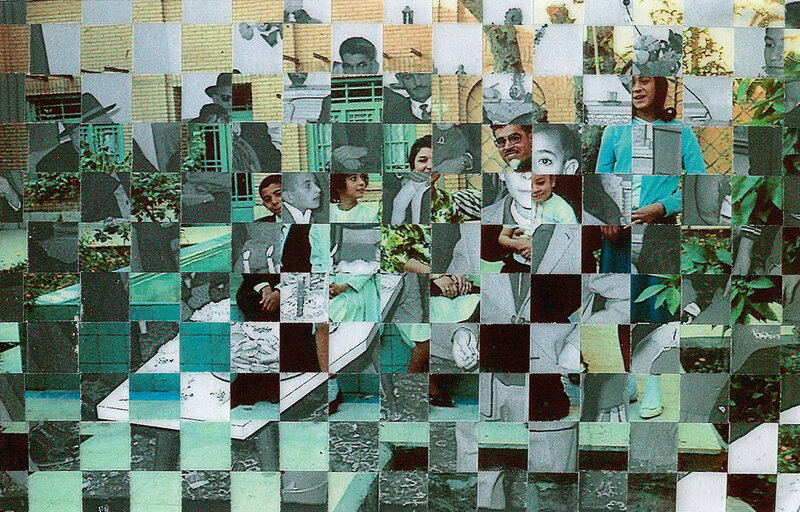 SA: The whole idea of weaving started with the Memento project, which was based on the background of my father who lived in the UK’s boarding schools far from his family and original Iranian background. Two photographs that represent his different upbringings and life experiences between an Eastern and a Western society were shredded and weaved together in different forms. The final image abstracted by the weave, for me, was a representation of how his current identity is formed based on his different cultural backgrounds. This was the beginnings of my weaving process and as I continued weaving it developed in both refinement and concept. The variety of patterns and possibilities within each weave when combined with the aesthetics of my archive encouraged me to continue to explore the technique further. AT: As a photographer/visual artist I myself moved through several modes of making images, under different genre heads live documentary, photojournalism, portraiture, then onto what is considered the conceptual fine art aesthetic. Looking back all that stuff was made with the same motivation as my latest work, I just felt that I could only say so much with documentary photography, my ideas needed to be express beyond this method. You seemed to have taken a similar journey looking at your website and seeing projects like Nature/Culture and Tehran at Night. Now your work has to do with weavings, historical archives and such a personal motivation behind the making ? How does one evolve or navigate through to the point at which you started to where you are now? SA: I totally agree with what you mentioned and I had a very similar journey. I loved documentary photography and photographing people but I got to a point that it wasn’t satisfying for me anymore. I thought I want to take my work on a different path, exploring different mediums but still with a strong emphasis on the captured image. I wanted to find a way to manipulate the images, to be able to narrate a story, so I started exploring with photo weaving. Through the weaving process I can almost animate an image by placing people in different scenes and playing with compositions, colour and protagonists to help with the story that I have in mind for each work. As I developed the way I used the images and the weave with them, the work’s surface was something I wanted to refine. I wanted to create an interesting object in itself which has lead me to explore different possible finishes for a completed work. I feel the varnish and finish of the surface can give the composition a permanence, creating a one of a kind object like many of the archival photographs have become themselves. AT: You talk about the weaving technique abstracting the final image, and how it represents your father's current identity based on his different cultural backgrounds. Abstract painting is something that I draw inspiration from, and also many photographers who work in abstraction. Who are some of your artistic influences when it comes to abstraction if any? And what strengths do you think abstraction provides that "straight photography" can't? SA: Abstraction is something that has always interested me. Artists like Robert Delaunay, Paul Klee and Wassily Kandinsky have been an influence and from the field of photography, probably Man Ray. Im interested in how abstract art has experimented with colour, pattern, shape and composition as a form of visual language, often breaking down a composition to its basic elements. For me looking at abstraction in art has allowed me to focus more on exploring the relationship between forms and colour in my work to present my ideas on memory, something that itself can be quite abstract. AT: What's next for you, your short-term or long-term goals? SA: Following my previous work on cultural identity and family history, I am expanding my archive with a focus on the relationship between landscape, memory and our own identity. The identity of a culture is influenced by the landscape it inhabits, so our surroundings form a large part of who we are. I like to experiment with how I can compose an image using photography as a material. So I am always looking to find and explore new archives of images from which to draw inspiration.